Support the Chicago French Bulldog Rescue and show your love of French Bulldogs by getting a hoodie! Was rescued from a shelter- prior to that, she was found wandering the streets in an area that has a lot of back yard breeders with a lot of frenchies. We believe they bred her till they were done with her and then kicked her to the curb. Jolie is a beautiful, healthy, spayed female Frenchie who is approximately 3 years old. 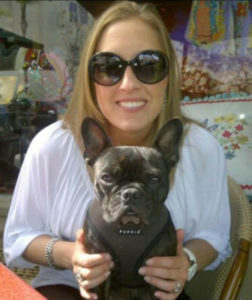 She is the epitome of the best in French bulldogs! She’s affectionate, she loves attention and loves to play! Cody is a puppy mill survivor and is a very easy going and calm dog. She is still learning to trust people, but she’s making progress everyday. She is still very unsure and gets nervous when adults walk up to pet her. She gets along great with my 3 children. She gets less nervous around them than adults.